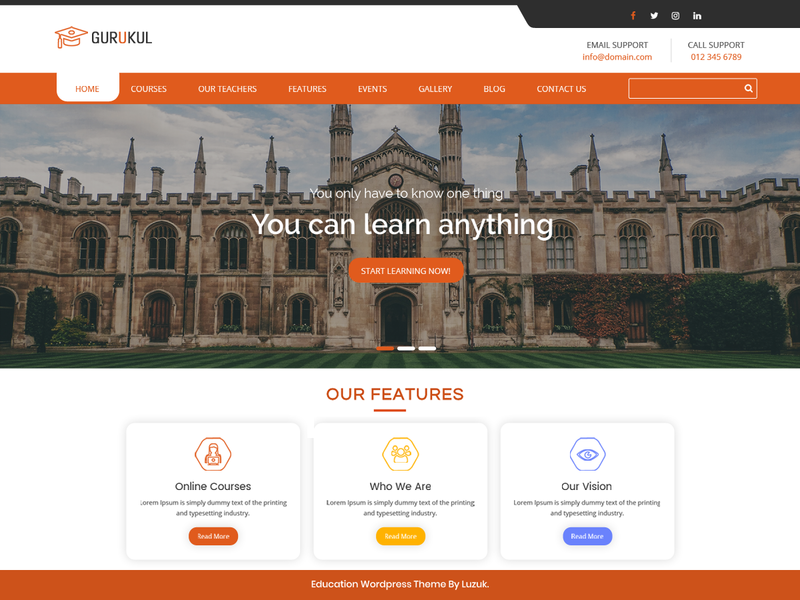 LZ Gurukul Education is a Education WordPress theme developed especially for websites that deal with any market type: The clean Education theme is purely mobile responsive supporting all screen size devices. The theme is so user-friendly and easily customizable that even if you aren’t a professional developer, you can work on it. You get ample of personalization options to modify the theme into your choice of look and appearance. The theme has an elegant banner thereby allowing you to feature your business in the best manner on the homepage itself. The testimonial section makes it more alluring as it displays the feedback given by people who have visited your WordPress website. Furthermore, the Call to action (CTA) button drives in abundance of clicks giving a boost in lead generation. The Gurukul Education is highly interactive with a number of pages to display stunning meals! The different shortcodes keep you away from indulging in the source code. The social media integration removes the need to have additional social media plugins. The SEO friendly nature of the theme guarantees to bring your site on top of search engines. Built on Bootstrap, using optimized codes, the theme is clean and extremely lightweight.